tell your Nawaz Sharif that we are not killing anyone you and your b*tch Hafiz Saeed are sending terrorist to kill kashmiri people dont forget india is your Dad. you shoud respect your dad and pm modi! WE LOVE MODI! 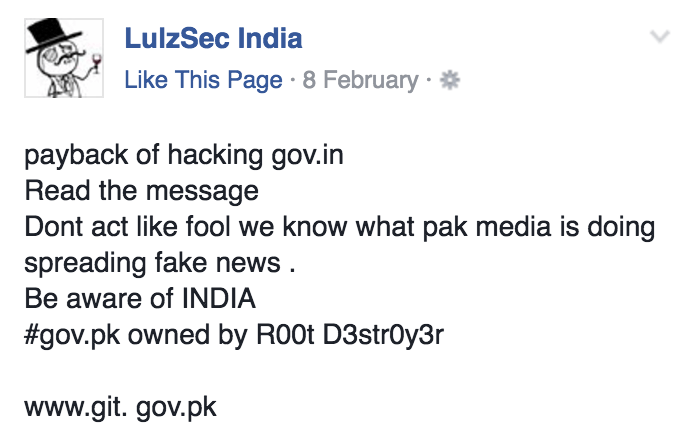 According to the hacker’s group, Lulzsec India’s official Facebook page. A group member addresses the hack by leaving a post and saying that the attack is in retaliation of Pakistani hackers hacking and defacing Indian Government websites. The attack on the Pakistani government agency comes after the Pakistani hacking group Pak Cyber Skullz hacked the official governmental website of India’s District Education Office Surat. As of the writing of this article, the website is still defaced. The point of injection into the website or vulnerabilities are still unknown. The attacker may have taken advantage of other websites being hosted on the website and could have symlinked through from within the server to deface the governmental website. The ties between the two countries only seem to worsen. It seems as the political stability between the countries begin to tremble and weaken, the defacements and destruction of websites owned from both sides of the country increase.